CA Technologies automation solutions help organizations increase business productivity by simplifying the management of complex workloads and empowering development teams with self-service tools that accelerate the development and delivery of new and enhanced applications. CA Technologies commissioned Forrester Consulting to conduct a Total Economic Impact™ (TEI) study and examine the potential return on investment (ROI) that enterprises may realize from automation. The purpose of this study is to provide readers with a framework to evaluate the potential financial impact of CA on their organizations. 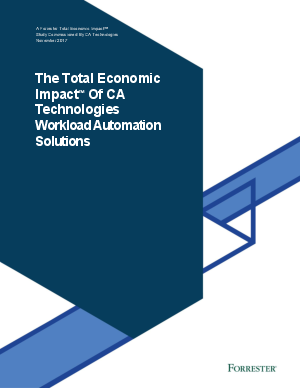 To better understand the benefits, costs, and risks associated with CA workload automation (WLA) solutions, Forrester interviewed an existing customer with years of experience using CA. The organization that Forrester interviewed manufactures consumer electronics that it sells through retailers around the globe.